MPs from the Maldivian Democratic Party (MDP) have again reported receiving death threats, with the party reporting messages sent numerous members its parliamentary group members on Thursday. ‘We will kill you all. 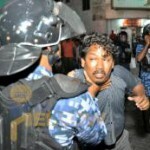 God is great,’ read the most recent message received by MDP Spokesman Imthiyaz ‘Inthi’ Fahmy on Thursday (September 18). “As far as I know, MDP PG leader Ibrahim Mohamed Solih, MP Mariya Didi, former Speaker Abdulla Shahid, Eva Abdulla, PG Deputy Leaders Rozaina Adam and myself, and MP Ali Azim have constantly been receiving death threat SMS’s,” Inthi told Minivan News today. Former President Mohamed Nasheed has also received similar messages, said Inthi. “We live in fear,” he added. The growing culture of death threats has crossed the political divide, with Jumhooree Party (JP) leader Gasim Ibrahim the most high profile figure to receive such intimidation. The JP has publicly accused political opponents of being behind the threats, which they have suggested are being sent using online phone duplicating software. 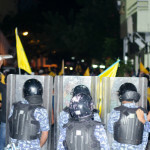 The MDP has accused the government of failing to utilise its resources to find the culprits. Journalists from outlets affiliated with both pro-government opposition parties have also been in receipt of threatening messages, prompting international concern. Inthi revealed today that he had even received a threat after submitting a motion in the Majlis to discuss the missing Minivan News journalist Ahmed Rilwan last month. “On the day I submitted the early day motion to Majlis about Rilwan case, I received an SMS to say ‘mind your business or else we will have to slit your throat’,” said Inthi. Police have been working with local telecommunications companies to trace the messages, though the Communications Authority of Maldives has noted that threats sent from abroad or online are difficult to trace. Discussing the problem today, the Maafannu North MP noted that such messages were becoming so commonplace that the party had ceased to publicise each and every incident. “We have officially lodged these cases with the police, the Human Rights Commission of Maldives and the Majlis long ago but no action seems to have been taken by the authorities,” said Inthi. The Inter-Parliamentary Union (IPU) noted last month that the official reaction to these threats would be a test of the country’s democratic credentials. “IPU is deeply concerned by these acts of intimidation against MPs in a country where many parliamentarians have been victims of attacks, harassment and arbitrary arrests in recent years,” read a statement from the organisation. “[T]he authorities’ response to the threats and their capacity to promote, with the help of the opposition, real inclusiveness and political dialogue will be a litmus test for the democratic process in the Maldives,” said IPU Secretary General Martin Chungong. Ah, but Mr. Inthi, the "authorities" you speak of are the ones responsible for sending you those death threats. A people who simply live with only one hope, a hope that is only going to be fulfilled once you cease to exist, you should not expect niceties from them as long as you don’t go with their way of life. Do you think such people can rationalize anything that is against their whole purpose of life? MDP is labeled as a group that is racing with time instead of being in the past like them. This is the view of some 110,000 people against some 60,000 people. These people definitely will do anything to quell such voice at any cost. You should not expect from those who came to power with the help of these people will be sympathetic to anyone who is labeled as MDP, this rift of the people is simply ideological, it is not political rift, a homicidal against freedom. Good luck MDP MPS, even you are a devote Muslim; you are in danger as long as you call yourself MDP man or call for human rights. The majority is homicidal with the power in their hand that doesn't have any value for human, the only thing they care is their ideology, and they really believe that they are rational and just, in whatever they do, and this is the biggest danger for anyone who slightly differs in their opinion.